Dina attended Bethlehem University and returned to Holy Family Hospital for a summer internship in the finance department. She later graduated at the top of her class from the University’s Business School. In 2011, Dina became engaged to her high school sweetheart, Ibrahim Boullou, whom she had known almost her entire life. The couple married in 2012 at the Church of the Nativity. Since Dina was born on February 26, 1990, Holy Family Hospital has delivered over 63,000 babies and treated thousands of women in its outpatient clinics. The Hospital has grown from the original 26-bed facility to accommodating over 60 beds, including an 18-bed Neonatal Intensive Care Unit. 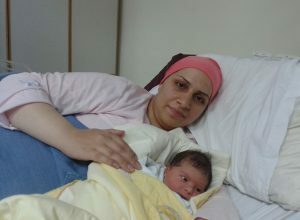 Holy Family Hospital plays a vital role in the Bethlehem region, providing employment and life-saving medical care as the primary referral teaching hospital for not only the local community but United Nations Refugee camps as well. 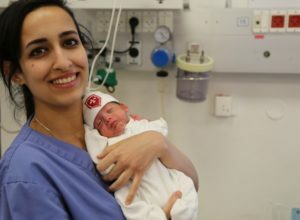 After Amir was born, the doctors and staff at the Hospital celebrated another child that was brought into the world and another generation of mothers that continues to receive the best available medical care and support. We are so thankful for our supporters at Holy Family Hospital of Bethlehem Foundation. 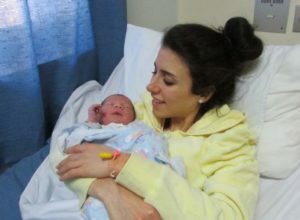 Your generosity and care will continue to make an immeasurable impact in promoting the health and wellness of the next generation of mothers and children in the Holy Land.